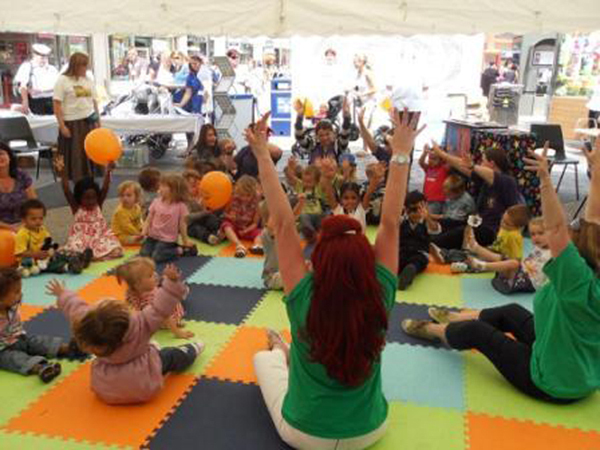 Music Mites use original songs and creative workshops to offer a participative style of music making to parents, carers and practitioners supporting the development of young children. Want a party that your child, their friends and the adults love, which takes the minimal amount of organisation? Alternatively, do you simply want to provide some fantastic children’s entertainment as part of a christening, wedding or family day celebration? The Music Mites Party Team will help make the day extra special. Running 45 minutes, and packed full of great musical entertainment and activity, their parties capture children’s imaginations, channel their energy and are suitable for one to six year olds. However large or small the event, their music, activities and assortment of props – from drums and shakers to tapping sticks – will engage every child, making it party to remember for all the right reasons! In addition to the music, they can organise craft activities that complement your party’s theme. These can be musical crafts (making and decorating shakers, drums and tapping sticks) or making masks, jewellery, models, paper dolls or fairies with costumes! Workshops are based around subject and musical themes that cover many aspects of the Early Years National Curriculum. Originally compiled as a training and teaching resource for practitioners in early years settings to enable a rich and varied music provision as part of everyday activities. These Music and Movement Programmes are highly recommended, supporting Early Years Foundation Stage both in a setting and at home. A popular choice for primary schools and nurseries, Music Mites essentially offer four services that can be tailored to your requirements. • Parent Workshops are an excellent way for creating links between parents and an educational setting. The parent workshops empower the child’s primary carer to support learning in the home environment. They have been very successful in supporting a child’s transition into school. Feedback they have gained indicates that pupils attending with parents before the summer holiday love joining in with the familiar songs, especially during the first weeks of school, which aids transition period. Whether it is visiting your setting on a regular basis, making special visits to celebrate a key theme or training all your early years professionals to use their programmes, Music Mites offers fantastic resources for early year settings. Through the experience and feedback gained from their clients, Music Mites is continuously working on creating new and innovative programmes to make sure that children have access to great music to support their development. They can write new songs and compile programmes to support any specific area of learning or to link with conference topics and party themes. “The children had a brilliant afternoon; everything was carefully planned with lost of hands on activities for the children and the adults. The music finale was brilliant as the children were able to use what they had made to make music. Every child was enthralled and involved.” Early Years Play Worker, Brandlehow Activity Centre, Surrey.